* Limitations apply. See Program Terms and Conditions on the savings offer. This offer is not valid under Medicare, Medicaid, or any other federal or state program. Novartis reserves the right to rescind, revoke, or amend this program without notice. Dedicated to providing assistance along the way, the ILARIS Support Program includes a wide range of free support services, all in one place. Works with the insurance companies to determine benefits and assists with prior authorizations and appeals, if needed. 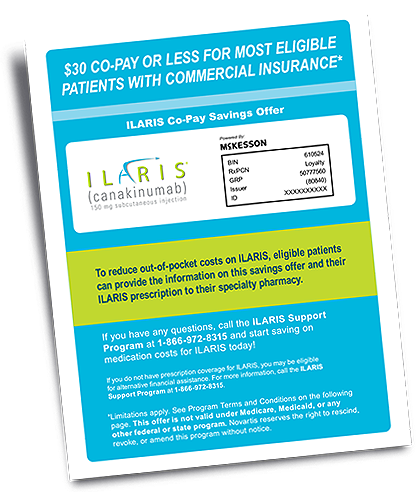 Get the first dose of ILARIS free if eligible and drug approval was delayed for more than 2 weeks. At the request of a healthcare provider, a nurse can administer ILARIS injections in the comfort of a family's home. This service is available in all 50 states and Puerto Rico. The information on this page is intended only for US healthcare professionals.